Andrew Weber (center) and Bruce Weber (in blue singlet at left) finish in the top ten. 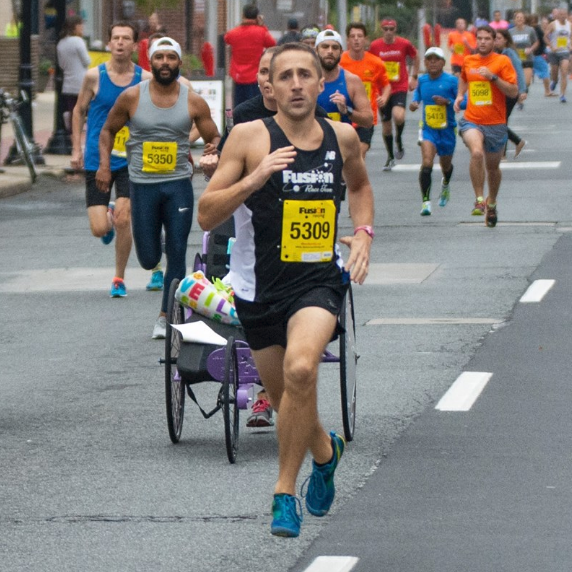 Nearly 700 participants showed up on October 6 for the annual Main Street Mile, contested here in Newark on the straightaway between the east end of East Main and the Deer Park Tavern. There were three Creek Road Runners among the standouts in the race. First of all, CRR Andrew Weber and CRR Bruce Weber (no relation, other than similar top-end speed) both cracked the top ten. “Weber A” finished 7th in 5:13.8 (5:12.9 chip), taking 2nd in the 30-39 age group, and “Weber B” finished 10th in 5:18.4 (5:16.9 chip) while winning the 50-59s and notching the highest age-grade score of any of the competitors at 85.1*. The second highest age-grade score was turned in by CRR Diane Kukich at 83.1*, by virtue of her 7:41.0 finishing time (7:31.2 chip). Kukich won the 65-69 age group. *A score between 80 and 89 is considered “national” class.